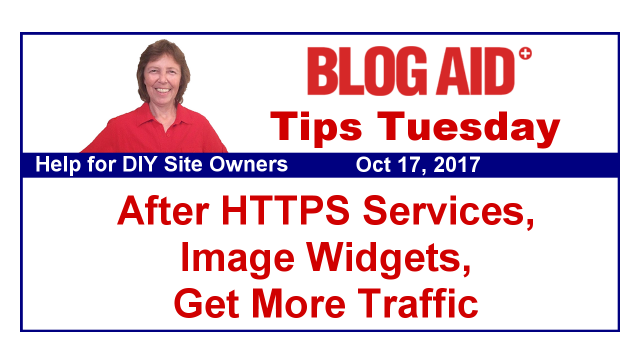 Yes, I’m still helping site owners get converted to HTTPS every day. And still getting in new requests every day too. But now I’m caught up to the point that I can move them straight into the process, no waiting. That’s because several of the site owners in the last wave hit snags and we’ve got delays. Not knowing their sites and not having all of the info for the pre-conversion checklist that has to be verified. My site audit clients didn’t run into any of these issues. They invested early in their site success and have easily rolled right through all site changes since and are staying way ahead of the curve on coming changes too. They are also making more money because now they have more human than bot traffic and faster sites where folks actually stick around to see their money makers instead of just abandoning the site due to slow loads. And they are paying less for hosting as they grow too, because we’ve optimized the heck out of their system resources. So they can get more traffic on less expensive hosting. There are millions of site owners who decided to go with a free HTTPS switch done by their host. A big problem with that is the host doesn’t tell you everything you need to update afterward. And even if they did tell you some of those things, you’re left to wonder if you did them correctly. You wouldn’t believe how many Google Search Console and XML sitemap issues me and my clients found prior to conversion too. We got those fixed first and then added the HTTPS versions after the conversion. I’m betting that many more site owners just think they have things set up correctly and then don’t get the new updates in there right either and they are really messed up now. So, that’s why I’m offering this new After HTTPS Service. We do it live and you don’t have to share any logins with me. I walk you through every step right then, and double check everything for you. Last week you may have seen the video I made of how using a Pinterest Widget of any kind severally slows down your page load time. At the end I gave you an alternative way to create a widget that is speedy. Well, looks like I jumped the gun a little because WordPress 4.9 has new features that make creating those widgets even easier and better. So, I modified the end of that Pinterest Widget video to tell you to see the new one I just made with 5 ways to create image widgets. You’re going to love how these look and how easy they are to make! Plus, it’s going to make it so super simple for you to change out your widgets seasonally too. Now, some of the ways I show you in this new video won’t be available until WordPress 4.9 rolls out, which is slated for Nov 14. So, hold up on making too many changes right now and I’ll remind you again in a month. This week me and 20+ testers are putting a really big, feature rich comment reply notification plugin through its paces. So far we’ve tested the basics and are now adding in more of the features. I think we’ll have a live meeting on this one so folks can see the backside because there are a ton of settings and customizations. I definitely want to get their opinions on those and test them out too. Last week we finished testing a plugin that is the free version of a larger paid service. It will take at least another week for us to finish up testing this last plugin. And then at least another week for me to put together the report for my webmasters and create a public comparison post. So, look for all that to roll out toward the end of the month. This past week I’ve also been getting caught up on my to do list. I’ve been reaching out to plugin and service providers on a couple of issues. For UpdraftPlus, I submitted a feature request. Turns out the number of backups you set to hold in remote storage is the same number that are held locally. The whole point of remote storage is to hold an abundance of backups so you can step back as far as you need to for a good one. I like to hold at least 3 month’s worth, but I don’t want all those on my hosting. So, I asked for there to be two settings in the plugin. For CloudFlare, I asked for some clarity on good ways to keep bad bots from running end around them and hitting my IP address directly. I got an immediate reply and will be testing out their suggestions. Be careful what you read about this. Some folks make is sound like the sky is falling. Here’s a pretty sane post about it, including patches. Newer Windows and iOS devices are likely not vulnerable. But Android is. Main thing is, stay off public wi-fi. That’s a hack or man-in the middle attack waiting to happen any day of the week. The social media monitoring company, Brandwatch, has acquired the content marketing platform BuzzSumo. The TechCrunch article was pretty shy on details, only saying that the companies would be run in parallel. But it does make me wonder about what kind of tracking might come to BuzzSumo plugins in the future. You might recall that the Discuz comment system started cookie tracking all commenters, and that made a lot of site owners drop them. So, we’ll be keeping an eye on this acquisition for sure. Got a lot of images on your site? A gallery plugin is a great way to highlight bunches by category and such. Go check out MaxGallery from my buddies at MaxFoundry. They’ve built some exceptionally nice features into their free plugin so you can give it a try. And they have some pretty cool add-ons to expand it too. They were kind enough to give me a license for the pro version, so I’ve got that on my testing list for later this winter. The new Gutenberg text editor represents the beginning of a revolution in how WordPress works. This post from Matias Ventura is a nice op-ed on what that means going down the road for you and me. FYI, Matias is one of the engineers on Gutenberg and it’s pretty evident that he has drunk a lot of the Matt Mullenweg vision for WP kool aid. So, take that for what it is while reading this post. I want to thank webmaster Larry Snow for sharing this in our Webmaster Level 6 Facebook group. I’m already poking around the new WP 4.9 beta releases, mainly for the new widgets and improvements to existing widgets. That’s one of the main focuses of this release. The other main focus is to the Customizer. And while most of us don’t use that currently, we will when Gutenberg rolls into the core. So, I’ll be diving into it more then. I’ll have a video tour of WP 4.9 when it gets closer to release in about a month. I am so guilty of this – not making adequate time for social media tasks. In this recent Social Media Today podcast, Pam Moore shares tips on how to make that time in your schedule, why you must, and ways to monitor effectiveness. That last one is the key. She says that monitoring lets you know if you’re wasting your time on certain platforms or not. That way you can maximize your efforts, and your precious time. Be sure to scroll to the end of the post because there are links to worksheets and such that will help you track and prioritize too. I used to pay a social media VA to help with my posting on several platforms. And she was exceptionally good. But, my stuff is just too dynamic to make that work well. And, it put me at too much of a distance to participate in it well too. I read this post from visibility expert Denise Wakeman that piqued my interest in trying CoSchedule. A full year of it costs about as much as just 2 months of the social media VA.
Now, she did a better job than this is going to do. But, I’m thinking this will help me keep my head in it better because CoSchedule also integrates analytics. Maybe my stuff is too dynamic for any type of automation, whether human or service. But, I need to give it a try. No matter what a service costs, it’s less money than what I’m losing by not posting at all, and that’s the reality I had to own up to. CoSchedule has a free trial. I’ll be using Denise’s affiliate link for mine. Hope you do too as a great way to say thank you for all the super tips she provides on it. Y’all know that I adore the guys at Stone Temple Consulting. They are my go-to folks for all things SEO because they do the very best case studies and their SEO predictions are spot on. But just like advice from Yoast, we have to keep in mind who their bread and butter clients are, and that ain’t us little bloggers. It’s bigger, enterprise level sites. So, the target audience for this post is what was on my mind as I was reading it. Everything they say about why to use AMP is true, but true for those enterprise level sites, not us mommy blogger types. I’ve had a couple of clients try to implement AMP and they were so sorry they did. Traffic and revenue both plummeted. And all these months later Google is still blowing their crawl budget de-indexing all of those 404 AMP links that they crawled while it was live, and broke after it was taken out. It’s amazingly difficult to make the kind of blog post formatting we use work for both Google’s AMP and Facebook’s Instant Articles. So, my advice, for my audience, is to continue to leave both of them alone for now. Everybody who deals with website clients of any kind deal with this – scope creep. I can say from hard earned experience that projects which got out of hand or turned a different direction helped me create better contracts. And lack of contracts is the #1 reason you, as a designer or developer, lose your shirt on a project. The #2 reason you lose your shirt is not enforcing your own contract. Get okay with saying no when you need to. I’ve had plenty of folks contact me with projects that had red flags all over them or were too far out of my wheelhouse. I just said no, and told them why. The overwhelming majority of them come back and wanted to do things in a more sane way. I’ve also turned down or fired big money clients because they don’t run a business. They run a circus. And I don’t need the stress of that. The cash cow money is not worth it. So, learn to stand your ground and run your business in a way that makes sense to you. Those headache projects you go broke on in the end are just not worth it. And that’s primarily what this scope creep article addresses too. That’s why you have a site. Donna Merrill has the skinny for you on ways to get more eyeballs on your site. Should You Add Push Notifications to Your WordPress Website? Once you do get traffic to your site, then what? You want them to convert in some way. I have a couple of clients using push notifications for optins. They have mixed feelings about it. They are getting more subscribers, but they are locked into the service providing the push and the email list integration. If you’ve been seeing these things on sites and are thinking about adding them to yours, see this post on Torque with the pros and cons. It will help you make a more informed decision about it. Thanks for the link to my CoSchedule post. As a user, you can create a posting schedule that works for your content. You can also create task lists and get email reminders when something needs attention. With the Requeue feature, I look at my analytics to determine which posts got the best engagement: likes, shares, comments and then only put those on an indefinite posting rotation. From time to time I review what’s in the rotation and remove anything this is not current. Thanks for the extra tips Denise. I would definitely have to look at the analytics constantly to take non-current out of circulation. That’s one of the things that appeals to me, though.